Castilian (castellano), that is, Spanish, is the native language of the Castilians. Its origin is traditionally ascribed to an area south of the Cordillera Cantábrica, including the upper Ebro valley, in northern Spain, around the 8th and 9th centuries; however the first written standard was developed in the 13th century in the southern city of Toledo. It is descended from the Vulgar Latin of the Roman Empire, with Arabic influences, and perhaps Basque as well. During the Reconquista in the Middle Ages, it was brought to the south of Spain where it replaced the languages that were spoken in the former Moorish controlled zones, such as the local form of related Latin dialects now referred to as Mozarabic, and the Arabic that had been introduced by the Muslims. In this process Castilian absorbed many traits from these languages, some of which continue to be used today. Outside of Spain and a few Latin American countries, Castilian is now usually referred to as Spanish. Castilian (or Spanish) is the dominant language in Spain, and therefore was the language that was brought by the New World Conquistadores during the Spanish colonization of the Americas. Due to this gradual process, the Hispanophone world was created. As Castilian was the language of the Crown, it became the official language of all Spain, used side by side with other languages in their regions for centuries. 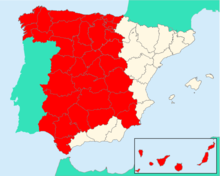 During the years of the Francoist State (1939 to 1975) there was an attempt to suppress the regional languages in favour of Castilian as the sole official language, causing a backlash against the use of Castilian in some regions after his death. In Spanish, the word castellano (Castilian) is often used to refer to the Spanish language, alongside español (Spanish). See Names given to the Spanish language. Roman Catholicism is deeply tied to Castilian culture and identity and is the religion of the overwhelming majority of Castilians, as a result of the settlement of Christian populations and forced assimilation of religious minorities (particularly Judaism and Islam) during and prior to the Spanish Inquistion. The presence in the region of minority religions such as Protestantism, Orthodox Christianity, Islam or Judaism are the result of relatively recent conversions or immigration.